Located about 20 miles east of I-29 on Hwy. 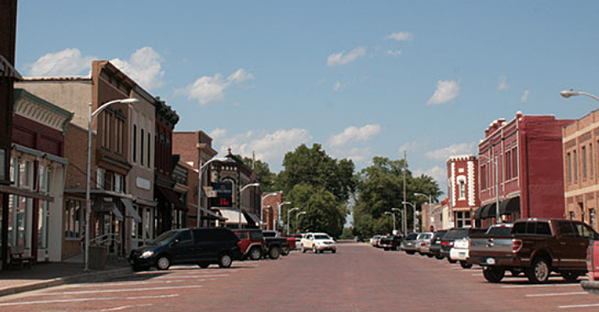 30, Woodbine, Iowa is a picturesque town that offers the best benefits of rural life, while still being close to big city amenities. Residents enjoy strolling along the brick streets of its historic Main Street and hiking along nature trails at the Willow Lake Recreation Area or traveling less than an hour to appointments or shopping in Council Bluffs or Omaha. Woodbine is also the home of our Woodland Apartment facility. The Woodland Apartments feature quality and affordable homes for those 62 and older, or those living with a disability. There are 48 one-bedroom apartments and residents enjoy the included utilities (electric, heat, water, garbage and sewer) along with large closets, Internet and a patio. The facility provides barrier-free accessible units along with appliances, off-street parking, controlled building access, a large community room, laundry facility, plus an onsite property manager and 24-hour maintenance. There is even outdoor yard space, complete with lawn care and snow removal. A unique and free Service Coordinator program is also offered. This program is designed to promote and support self-sufficiency and independence for individuals living in the Woodland Apartment community. Renovated in 2012, Woodland Apartments received a newly resurfaced parking lot offering off street parking, completely new kitchen cabinets and appliances, new bathrooms, brand new flooring throughout the entire building and updated controlled access systems, as well as the building elevator. There is much to see and do in the Woodbine community. Spend a day living in the past by strolling through the historic downtown district, sampling pie at the renovated canopy gas station and having a cool drink at the historic drugstore soda fountain. Nestled between White and Normal streets at 1105 Park Street, this facility is just blocks from the city park which features a heated pool, picnic shelters, an outdoor stage, horseshoe area and white floral gardens. The facility itself hosts special events for residents or just invites everyone to meet for coffee in the community room and swap stories. If you or anyone you know might be interested in renting one of our Woodland Apartments, contact the main office toll free at 877-521-8750 or go to their web site www.oakleafpm.com and fill out a rental application. There is no application fee.